I only found out recently that the government are bringing in carrier bag charges from 5th October 2015 for single use carrier bags. 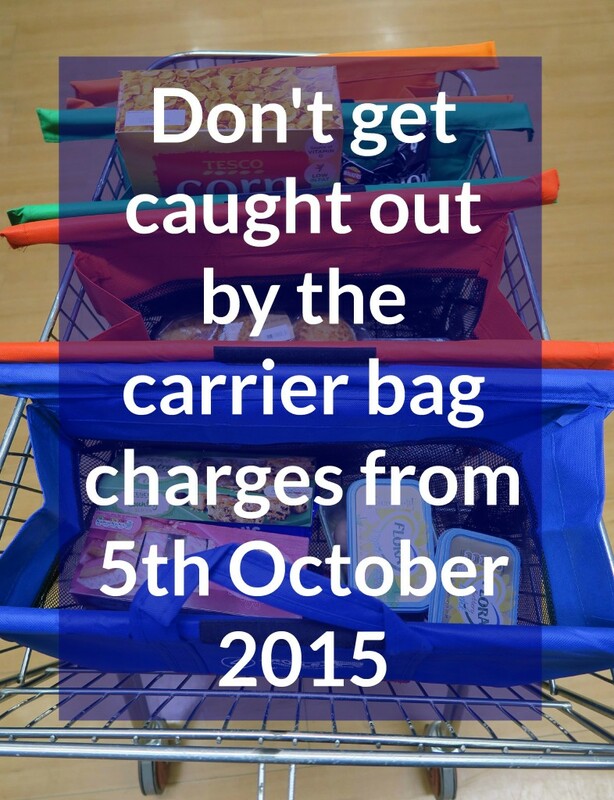 They will be charging you 5p for every carrier bag you use, so I think it is time to get re-using your bags. I must admit a couple of years ago I did get into using reusable bags for my shopping, but like a lot of people I would leave them at home, forget to put them back in the car and just rely on the shops having carrier bags. I do say no to carrier bags in the shop if I have something else to put the item into, a handbag or a larger carrier bag from another shop but I think we need all take responsibility now and start using less carrier bags. Not only just to save money but to help the environment. So when I saw these Trolley Bags I thought what a great idea! They come in a large version and an express version, I am reviewing the express version. The original larger version is for a standard full size trolley and the express is for your smaller trolleys. This works great for us as we do a larger shop online and then pop into the supermarket for any top ups we need. 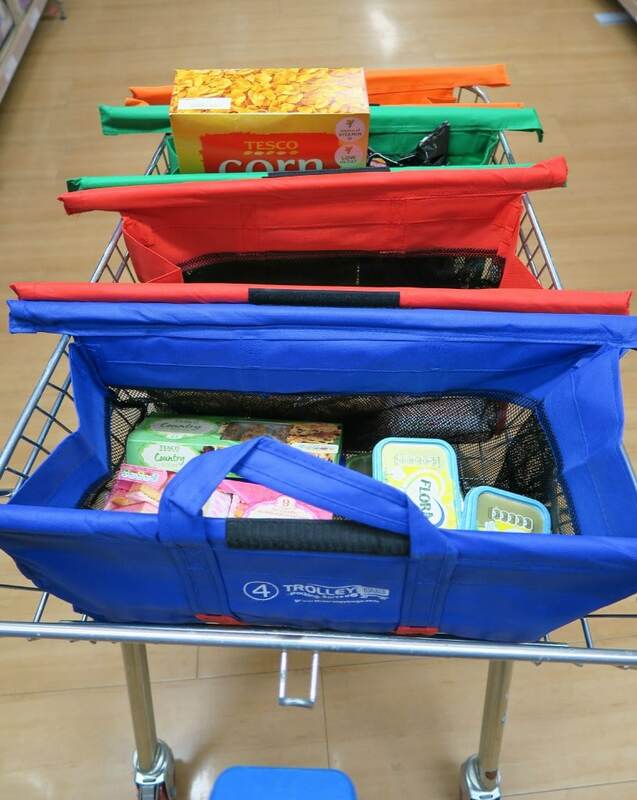 Trolley Bags express comes with 4 bags which can be rolled up and tied together with velcro for ease of storage and carrying. You can either hook it onto the trolley hook whilst you fill up your trolley or you can open them up empty and fill with shopping. 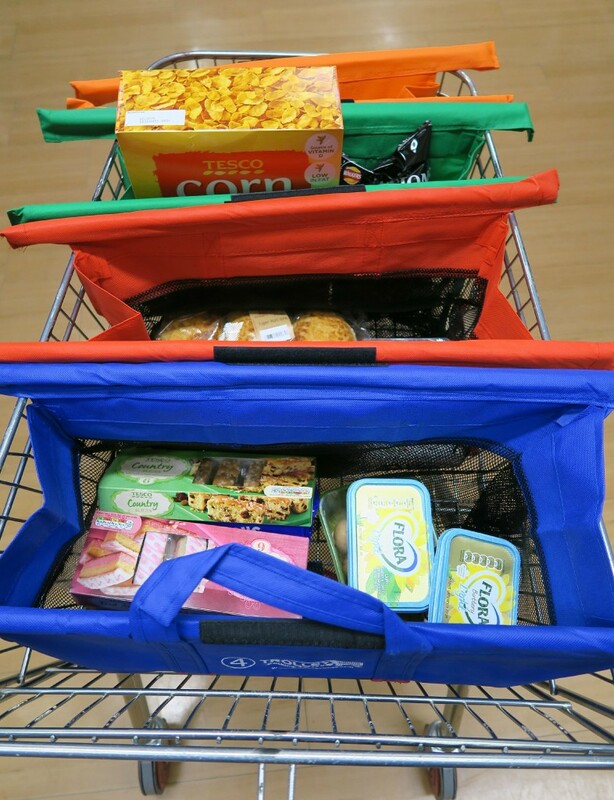 I haven’t ever used the scanners where you scan your shopping as you go around the supermarket, but having the Trolley Bags express means you could fill up the Trolley Bags whilst you scan your items, then you don’t need to even take the shopping out the bags once their in. 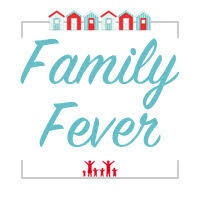 Just load them into the car and unpack when you get home. 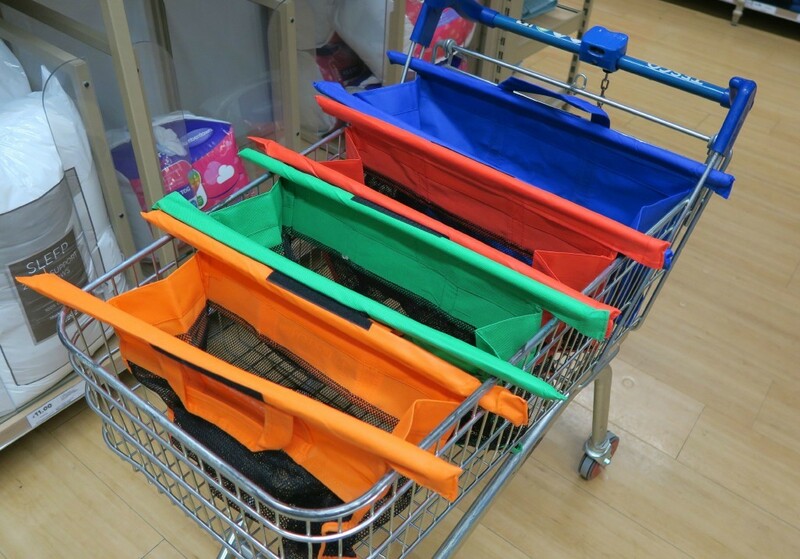 Trolley Bags express have a solid pole running around the top of the bag, which rests on the top of the trolley, this keeps them sitting on top of the trolley well and taken the weight of the shopping. The bag it’s self is flexible so you can fill it up nicely. 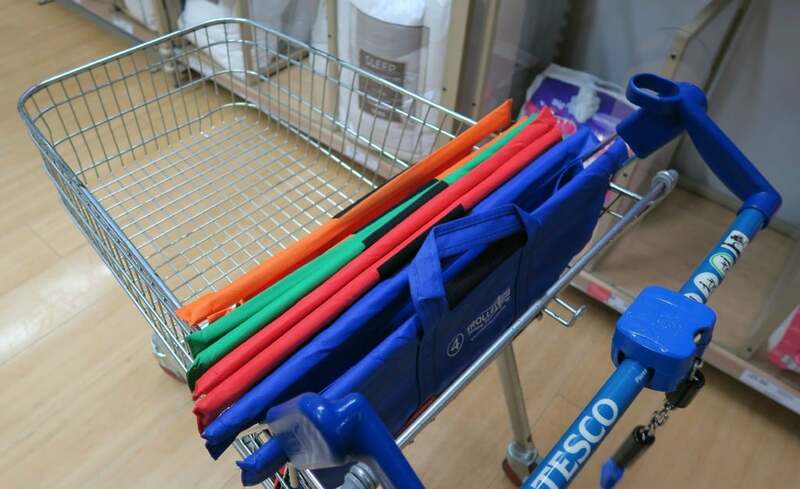 My only fault I have found is that 4 doesn’t quite fit fully open in the trolley, you can see the orange one at the end isn’t able to fully open when the others are filled. However I don’t know if this is just for Tesco trolleys, but I will just use that bag for smaller items. The idea of the colour system is that you can sort different types of items into each bag, chilled in one, meat in the other ect. The Trolley Bags Express is £16.99 plus £4.99 shipping which I do think is good value, these are of good quality and will last ages. Where as they are charging 5p per carrier bag and it is surprising how many you use in one shop. I am going to be using these bags for my shopping all the time and I think I might even look into using the self scanners to save taking the items back out of the bags again. *I was sent these Trolley Bags Express for the purpose of this review, however all opinions are honest and of my own. These look really cool. I’m so glad I found this post because I saw these on Pinterest I think a few months back and thought they were an awesome idea. But as can happen on Pinterest I couldn’t actually find who made them or where to buy them. I am glad I could help! They are such a great idea and just in time for the carrier bag charges. I just have to remember to bring them shopping with me! These look awesome! I love organised shopping (OCD-ish) and I had no idea about the charge, so thanks for highlighting that!! Oh glad I gave you the heads up, they are great for someone who likes to be organised! Yes they have been really handy to have, I am sure I will be the envy of people when they are having to pay the 5p per carrier bag!